I give these people money (and so should you). I was born on 9 June 1995. My parents were, at the time, running their own business and raising my sister (two years older) and my brother (five years older). I'd be their last child. Throughout my youth, my father was busy introducing the Internet to Amsterdam through his ISP, and building a commercial IP PBX. Together with my mother, he also managed the business he'd set up for those. This gave me a lot of access to computers, and I started programming when I was about eight. I learned a lot of web development through online tutorials. To host my sites my father gave me access to a small virtual server, which allowed me to teach myself about Linux systems and server management. 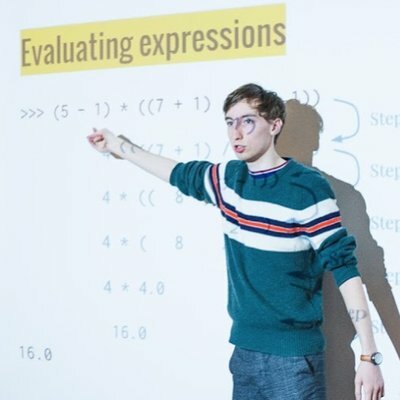 My free time during my high school years went to memes, video games, and learning about computer science topics like data structures and complex algorithms. A lot of my in-school hours went to computing in a totally different way: for several years, I acted as a teacher's assistant for my computer science teacher. It taught me how difficult teaching is, as well as how interesting the problem of teaching is. Together with several classmates I set up a project to build a new open source VLE and school homepage. Like many of my projects at the time, I never finished it. During my school years I also started working for my father in the summers. At first I worked on the in-house CRM and ERP. I was tasked with improving and maintaining the tools, which gave me a basis of product sense. Large swaths of my time were spent sitting next to coworkers, studying how they used the product and finding inefficiencies I could fix. After the fifth year of Dutch high school at the Cygnus Gymnasium I moved to Georgia, US with my parents and sister. There I got an American high school diploma at Forsyth Central within the first half year, and after half a year of traveling and socializing, my sister and I moved back to Amsterdam. At this point I had the intention to go to university in Edinborough, to study Computer Science and Mathematics. That never happened though: I got a job instead. I got hired as a frontend engineer at a local web agency, Wend, and discovered that my passion for building solutions far outweighed that for computer science. While my expertise still lied with web development, the fascinating part for me was building products: end to end solutions for real world problems. I was a lot more interested in studying that. To pursue that goal, I joined 3D Hubs. Here I'd get the opportunity to be much more involved with the product, and experience a high growth startup culture. Over the course of my two years at the startup, I took the lead on several projects, and one team. On the side I also coached more junior developers, taught a programming course, organized a meetup, set up and managed the network in a new office, and got deeply involved with recruiting. My first project at 3D Hubs was architecting and building an integration with another company's product. While we joined the long list of projects that missed several deadlines, it was a major learning experience for myself and the rest of the team. I learned a lot about architecting and kickstarting a product from scratch, building integrations with external products, as well as communication between teams and companies. The experience from that helped me a lot in my second large project. The team had decided we'd finally be migrating the website to a new stack. My team and I started picking out domains into Python-based microservices, moving away from a Drupal monolith. You've probably heard before that rebuilding a product in another stack is usually a bad idea, and I can tell you that that's entirely correct. Since a growing startup is always hiring, a lot of developers were involved in that process as well. I got fascinated by the problem space of recruiting and recruiting processes. The CTO, in-house recruiter and I set up a pipeline together and continued improving our processes. I probably interviewed every developer going through the process, and eventually also the potential replacements for the CTO. Through all the people stuff at 3D Hubs—the coaching, recruiting, team leading, and so on—I got interested in people problems. Eventually I got to be one of four Engineering Leads, tasked with leading a single team of four engineers. Aside from planning and technical decisionmaking, the CTO also involved us in broader department-wide decisions. It was not enough. To dive deeper into the leadership path of the engineering world, I left 3D Hubs and joined L1NDA, a Dutch SMB trying to convert itself into a growth-oriented startup. Here I joined as Lead Backend Developer, building and leading a backend development team, working closely together with the CTO. As someone with prior startup experience, I also took up a project to support the CEO with executing the cultural changes.